My rookie season in Denver with the Broncos, where in 1970, I was a ninth-round draft choice from a small non-descript Historic Black College University (HBCU) Alcorn A. & M. College, now Alcorn State University. Obviously, today everyone recognizes there are only seven rounds to the NFL draft. It can be safely said that no one expected this gangly 6’5, 228-pound country linebacker to make the Broncos team, much less to start every game his rookie year. It was our first home game at Mile High Stadium after coming off an away game victory at Buffalo. I must have made a pretty good impression on the Bills, as well as my first-year coach at Denver, Lou Saban. After my two years at Denver, coach Saban took the head coaching job at Buffalo and I was the first trade he made to build the Buffalo Bills football program. My First Game Memory - According to the online service Pro Football References and my vague recollection, this was our (Broncos) first home game of the year at Mile High Stadium, September 27, 1970, vs. the Steelers. I had defied the odds, all the naysayers, doubters, haters and others as I became the starting right outside linebacker (weak-side) for the Broncos. I had managed to outshine the competition during the preseason and mini camps by posting a 4.49-second time in the 40-yard dash, 28 reps on the 225-pound bench press and a 40-inch vertical. I think that still shines by today’s standards. The score was 13-7 in the third quarter when I blitzed from my weak side linebacker position and sacked Terry Bradshaw, the No. 1 draft choice of the Pittsburgh Steelers, in the end zone for a safety, making the score 13-9. Billy Van Heusen caught a 38-yard pass from Steve Tensi and Bobby Howfield kicked the extra point. We won the game, final score Pittsburgh 13, Denver 16. There is a funny twist to the story as I shared in June 2016, to Terry Bradshaw at a John Stallworth charity golf tournament for John’s Foundation in Huntsville, AL. 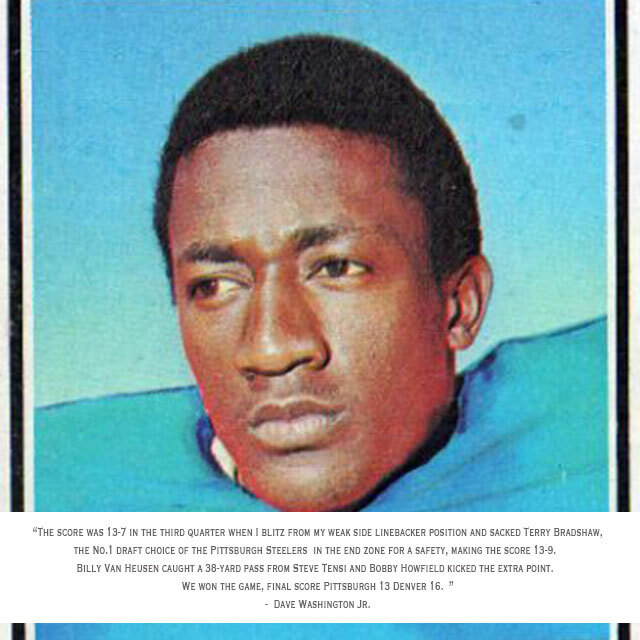 Terry was the first person taken in the 1970 NFL draft, by Pittsburgh, I was a ninth-rounder (#219) by the Denver Broncos and my college roommate was the last person taken in the 17th round (#442) by the Kansas City Chiefs. For a country kid from Mississippi, I never doubted that in my first game in the NFL, I would shine and that I would be blessed to have a platform to inspire others to dream big, set lofty goals and SHINE. TO GOD BE GLORY.